There are always things that exist beyond our imagination! And, amongst them is a journey to the Mustang region in Nepal. It is a mystical place that lets you explore heaven amidst the undiscovered places on earth. Fall in love with the hostile environment as you traverse into diversity of vegetation. This region though isolated attracts many fellow travellers every year with its lust and charm. The word “Mustang” has been derived from Tibetan word Mun Tan that means fertile plain. Lying at the border of Tibetan, the landscape and culture of the place resembles with that of Tibet. 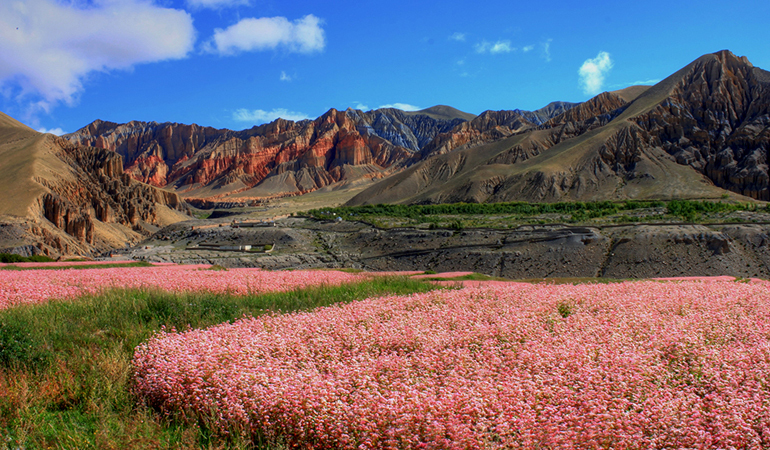 Mustang region is further classified into two regions – Upper Mustang and Lower Mustang. Based on your interest you can select the part of Mustang you would like to visit. 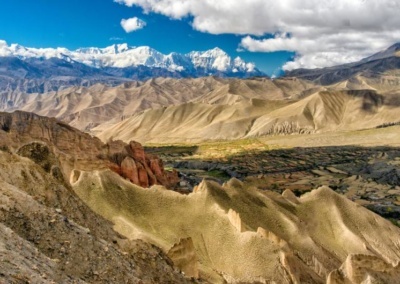 Generally, trek to Upper Mustang is more cherished by travel lovers than Lower Mustang. Upper Mustang Region is called the Kingdom of Lo and comprises almost two third of the Mustang Region. Kagbeni is the commencing point from where you enter into the mystic land of Mustang. 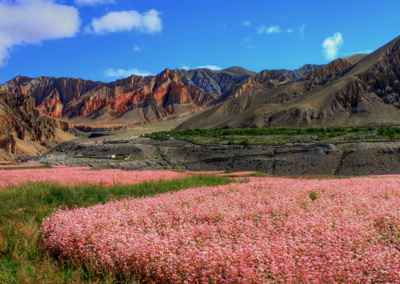 Entry to this region requires a special permit to non-Nepalese citizen and the fee is utilized for enhancing and maintaining the beauty of Mustang. 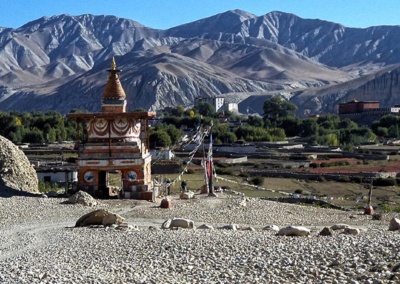 Once you enter the Mustang region, you can make out the prevalence of Tibetan Buddhist culture in that area which is marked by prayer flags, chortens, mani walls and stupas that you will encounter in your journey throughout. The people living in this area are tradition who still preserve their unique Buddhist culture intact. They are engaged in farming and yak rearing for livelihood purpose. The people living in this area are originally the descendants of Tibetans who had migrated here and have been living here since ages. The villages of Mustang consists of stone walled houses and flat roofs that is similar to the houses in Tibet. Mustang used to be a separate kingdom which was ruled by kings. Though monarchy deceased in 2008, the local people still recognized Jigme Dorje Palbar Bista to be the King to the Kingdom of Lo. Talking about the land of Mustang, it is mostly dry and rough. The land receives very minimum rainfall during the year. However, this beautiful place lies in the backdrop of Annapurna and Dhaulagiri which makes it a beautiful valley embedded inside mountains. The people residing here are generally Thakalis, Magar and Gurung people. They mostly follow Buddhism that is more Tibetan influenced. Tiji festival is a popular festival celebrated in Mustang that has its own religious and historical importance. People regard this ceremony as a celebration to chase away the demon from the villages. People dress up in their traditional colourful attire, chant prayers and perform many dramas that portraits the myths. Though secluded, the biodiversity, cultural uniqueness and diverse ethnicity here is not hidden from the people. Its uniqueness are its assets that makes it special that other populated trekking trails. Trekking to this area may be a bit difficult if you are afraid of silence and loneliness. 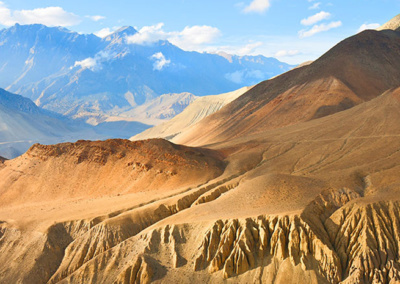 However, if what you seek is wilderness of nature and cultural diverseness then trekking packages to Mustang region is a must visit journey for you. So, try opting for mingling with the challenges of nature with Mustang Trek. You can have an awesome trek if you choose your journey in the dates between March to June and September to November. 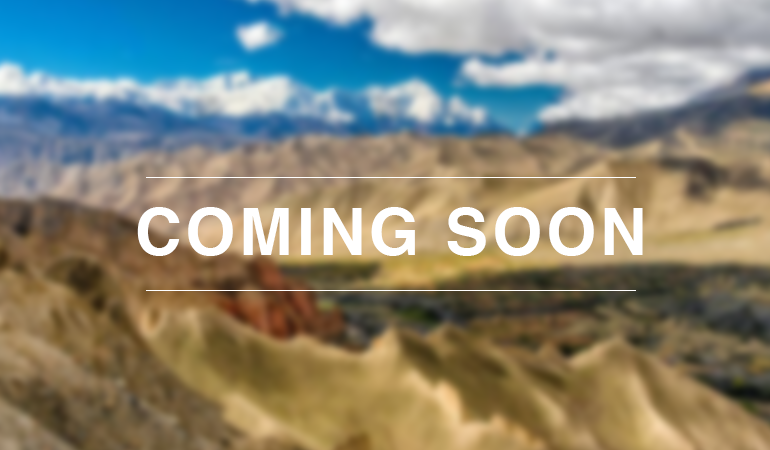 Get ready to be lost in the lust of beautiful Himalayas and Mustang valley!